2019 (Schedule) Advisor, Himalayan Institute for Global Skills (HIGS) . 2019 (Schedule) Give a lecture at Salon Feuyeau on "Soldiers and Crossdressing: Deep relationship between 'manliness' and 'makeup and female clothing' from a war researcher's point of view". 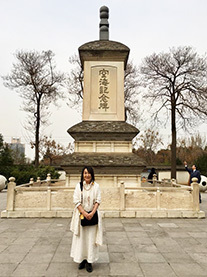 2019 Visits the historic sites in Xi'an, China, to collect materials for her future novel on Kūkai, a popular Japanese Buddhist monk who founded Shingon Sect some 1,200 years ago. 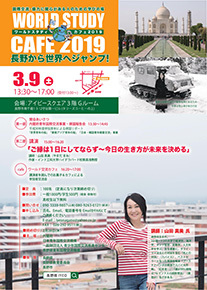 2019 Gives a keynote speech at annual function of International Youth Exchange Organization (IYEO) of Nagano, sponsored by Cabinet Office, Nagano Prefecture, Nagano City, etc. 2019 Visiting Assistant Professor, Department of Liberal Arts, Indian Institute of Technology Hyderabad. 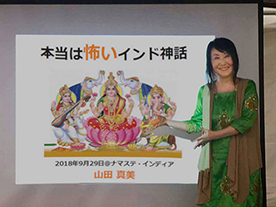 2018 Gives a keynote speech at Durga Puja Festival in Tokyo, sponsored by India (Bengal) Cultural Association. 2018 Gives a lecture at "Namaste India 2017", sponsored by Embassy of India in Japan, I.C.C.R., Ministry of Foreign Affairs, Tokyo Metropolitan Govt., The Japan-India Association, on "Fearful side of Indian mythology". 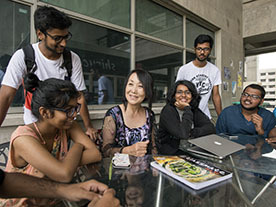 2018 Gives a lecture on "Power of Indian Women" as a part of Japan Inter Design Forum's Girl Power Labo at Doshisha University's Tokyo Satellite Campus. 2018 Gives a lecture for foreign researchers in Tsukuba City on "Benzaiten and Saraswati Connection - Japanese Culture and Society, Major Influences from India" at Ninomiya House in Tsukuba. 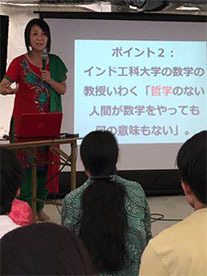 2018 Gives a lecture on "The latest situation in India from a viewpoint of a visiting assistant professor of Indian Institute of Technology" at Yokohama Port Opening Memorial Hall (AKA Jack's Tower) as a part of Yokohama Three Towers Day Festival. 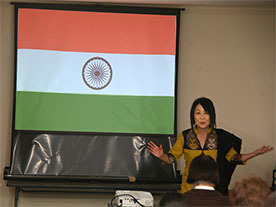 2018 Gives a lecture on "India's latest situation seen from the field of education" as a commenorative event for The Year of Japan-India Friendly Exchanges (certified by Ministry of Foreign Affairs), sponsored by Fueba (Non-profit organization) under the auspices of Nagano Municipal Government and Nagano Municipal Board of Education. 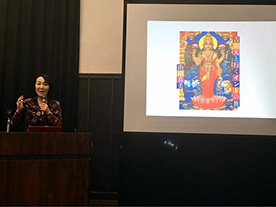 2017 Gives a lecture at "Namaste India 2017", sponsored by Embassy of India in Japan, I.C.C.R., Ministry of Foreign Affairs, Tokyo Metropolitan Govt., The Japan-India Association, on her journey to unique Hindu temples in India. 2017 Gives a special lecture at University of Delhi on "Indian Gods in Japan" for faculty members and students. 2017 Delivers a presentation on "Indian Footprints on Mishima's Posthumous Work" at International Conference on Japanese Literature held at University of Delhi, organized by Indo-Japan Association for Literature and Culture. 2017 Visiting Assistant Professor, Department of Liberal Arts, Indian Institute of Technology Hyderabad. The number of students reaches 172. She also participates in the "IITH - University of Tokyo Student Workshop 2017" to give a talk with the professors of IIT Hyderabad and University of Tokyo. 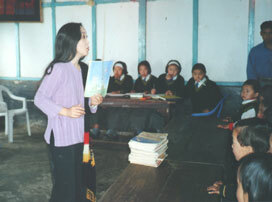 With her students during a break. 2017 Commentator for NHK's TV series "Premium Cafe: Odoroki no Indo (Startling India)" *NHK, Nippon Hoso Kyokai (Japan Broadcasting Corporation), is Japan’s only public broadcaster. 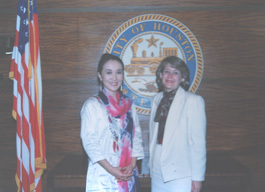 Mami (right) with NHK's executive announcer Ms. Ayumi Watanabe. 2017 Gives a 150-minute intence lecture on the Cowra Breakout. Besides the lecture, memorial bugles are served for war dead. Special lunch, replicate of the war time meal privided for Zero Fighter pilots during their flights, are served for the audience. 2017 Her life story is introduced in a 7-page article in "Josei Jishin", a popular women's weekly magazine in Japan. The title of the article is "NO PROBLEM IS THE MAGIC WORDS TO BE ALL RIGHT: THINGS I HAVE LEARNT FROM INDIA". 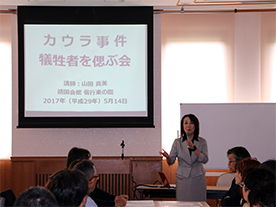 2016 Gives special lectures at community halls in Nagano City on "War and Japanese - World's largest POW breakout that was deliberately erased from the history". 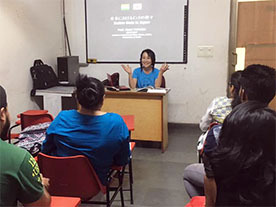 2016 Gives a lecture at "Namaste India 2016", sponsored by Embassy of India in Japan, I.C.C.R., Ministry of Foreign Affairs, Tokyo Metropolitan Govt., The Japan-India Association, on her experience as a visiting assistant professor at Indian Institute of Technology Hyderabad. 2016 Gives a special lecture at Tilak Maharashtra Vidyapeeth (TMV), Pune, India on "Indian Gods in Japan" for faculty members and students. 2016 Gives a special lecture at Indian Institute of Technology Bombay on "Indian Gods in Japan" for faculty members and students. 2016 Visiting Assistant Professor, Department of Liberal Arts, Indian Institute of Technology Hyderabad to give a series of 14 lectures on "Indian Gods in Japan - History, Identity and Supremacy in the Society". Last year there were only six students in the class. This year it dramatically increased to 164 in number. 2016 Publishes "Fortune 99%, Strategy 1%; Amazing Mindset of Indian People (Un ga 99%, Senryaku wa 1%; Indo-Jin no Cho Hasso-Ho)", a book on comparative culturure between Japan and India, from Kodansha. 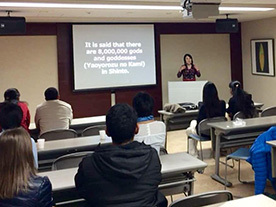 2015 Gives a lecture at "Namaste India 2015", sponsored by Embassy of India in Japan, I.C.C.R., Ministry of Foreign Affairs, Tokyo Metropolitan Govt., The Japan-India Association, on her experience as a visiting assistant professor at Indian Institute of Technology Hyderabad. 2015 Provides information/materials to NHK's special program "War Behind Closed Doors: Newly Discovered Real Voices of Japanese POWs". 2015 Moderator and panelist for "India-Japan Literary Festival 2015" held at Indian Embassy in Japan. Gives a lecture under the title "Mishima and I: Thirst for 'Indianness' and Literary Approaches". 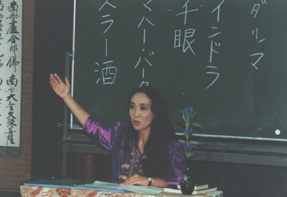 2015 Gives lectures at universities in Ethiopia on the themes of "Power of Women: The case of a Japanese noblewoman who engaged to the prince of Ethiopia in 1934", "'Mottainai' and Beyond: Spirit of the three Rs and daily cleaning by Japanese primary school students" and "Importance of Inheritance: Japanese management seen in the world's oldest royal family, enterprise and hotel". After the lecture, with female students. 2015 Mami's first grandchild, a girl, is born. 2015 Promoted to Visiting Assistant Professor, Department of Liberal Arts, Indian Institute of Technology Hyderabad to give a series of 14 lectures on "Indian Gods in Japan - History, Identity and Supremacy in the Society". 2015 Contributes columns on Indian politics and ecomomy to "Britannica Year Book 2015 (Japanese version)". 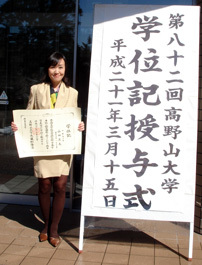 2014 Receives a doctor's degree (Ph.D.) in Modern Japanese History and Gender Studies from Ochanomizu University. The title of her doctoral thesis is "Reconsidering the Cowra Breakout of 1944: From the Viewpoints of Survived Japanese Prisoners of War and Their 'Everyday Lives' in the Camp". 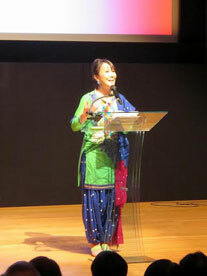 2014 Gives a lecture on Indian Mythology at "Namaste India 2014", sponsored by Embassy of India in Japan, I.C.C.R., Ministry of Foreign Affairs, Tokyo Metropolitan Govt., The Japan-India Association. 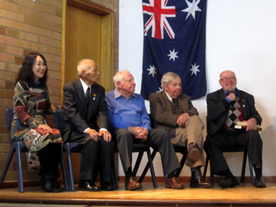 2014 Visits Australia as the leader of "2014 Australia-Japan Friendship Tour in Commemoration of Cowra Prisoner of War Breakout 70th Anniversary". 2014 Her paper "Bodies Living as POWs: Daily Lives of Japanese Soldiers at Cowra Internment and Prisoner of War Camp during World War II" is published in Journal of the Graduate School of Humanities and Sciences Vol. 16, published by Ochanomizu University. 2014 Liaison Officer, Cowra Prisoner of War Breakout 70th Anniversary Commemorations (Authorized by Office of the Mayor, Cowra Shire Council). 2014 Contributes columns on Indian politics and ecomomy to "Britannica Year Book 2014 (Japanese version)"
2013 Her paper "The Cowra Breakout Viewed by a Former Japanese POW who Suffered from Hansen’s Disease" is published in Japan Oral History Journal Vol. 9, published by Japan Oral History Association. 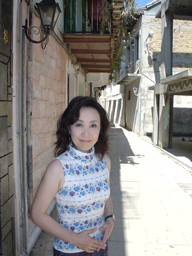 2013 Her paper "A Scene with Female Roles: Daily Lives in Prison Camps for Japanese Soldiers during World War II and the Deconstruction of 'Masuculinity'" is published in Journal of the Graduate School of Humanities and Sciences Vol. 15, published by Ochanomizu University. 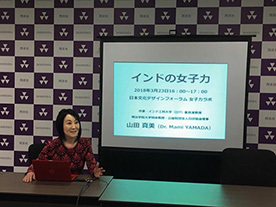 2013 Gives a presentation at Japan Oral History Association's 11th annual conference under the title "'Freedom of Expression' Versus 'Human Rights': Recent Incidents Against a Former Japanese POW with Hansen’s Disease". 2013～2018 Promoted to Specially Appointed Professor at Meiji Gakuin University, Faculty of Economics. 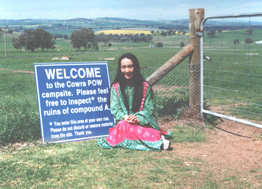 2013 Visits Australia to interview the people involved in the Cowra Breakout. right, the president Lawrance Ryan in the back row 2nd from right. 2013 Contributes columns on Indian politics and ecomomy to "Britannica Year Book 2013 (Japanese version)"
2012 The highlight of "Shi to no Taiwa (Dialogue with Death)" (2004) has been translated into Persian and published in "انسان شناسی و فرهن (Anthropology Journal)" in Iran. 2012 Gives a presentation at Japan Oral History Association's 10th annual conference under the title "Cowra Breakout Seen Through a Prisoner of War Who Suffered from Hansen’s Disease". 2012 Visits Australia as the leader of "2012 Australia-Japan Friendship Tour to Former POW Camp Sites at Cowra and Hay". 2012 Publishes "Books and the Library History" (coauthored texbook on library science for university students) from Jusonbo Co. She writes two chapters: The history of Indian libraries and the history of Islamic libraries. 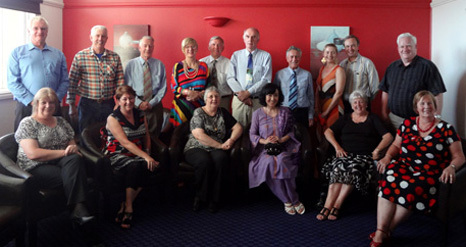 2012 Gives a presentation at Japan Oceania Association's 29th annual conference under the title "What was Cowra Breakout? : Perception Gap between Japanese and Australian, and New Verbal Evidence Given 68 Years after the Incidence". 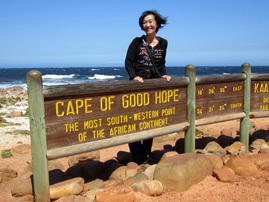 2012 Contributes columns on Indian politics and ecomomy to "Britannica Year Book 2012 (Japanese version)"
2011 Visits South Africa to collect materials for her future novel. 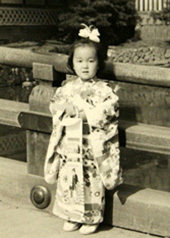 2011 Member, Japan Oral History Association. 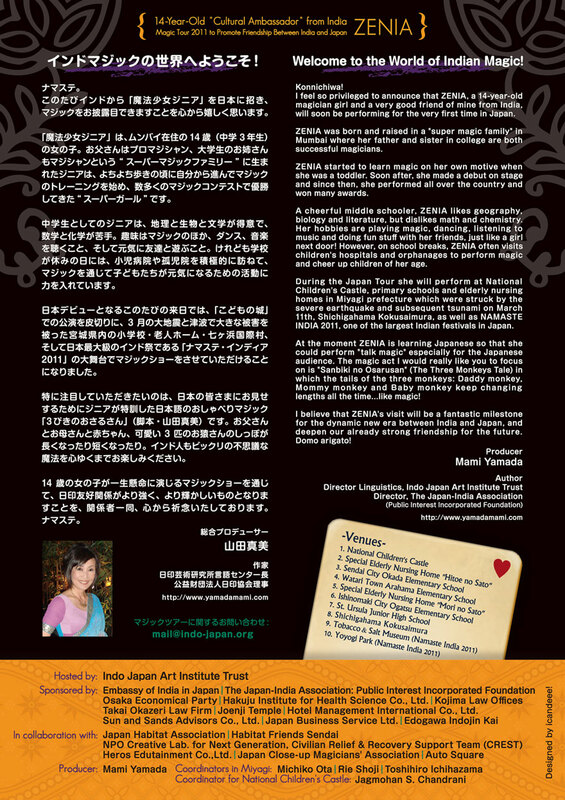 2011 Gives a lecture on Indian magic at "Namaste India 2011", sponsored by Embassy of India in Japan, I.C.C.R., Ministry of Foreign Affairs, Tokyo Metropolitan Govt., The Japan-India Association. 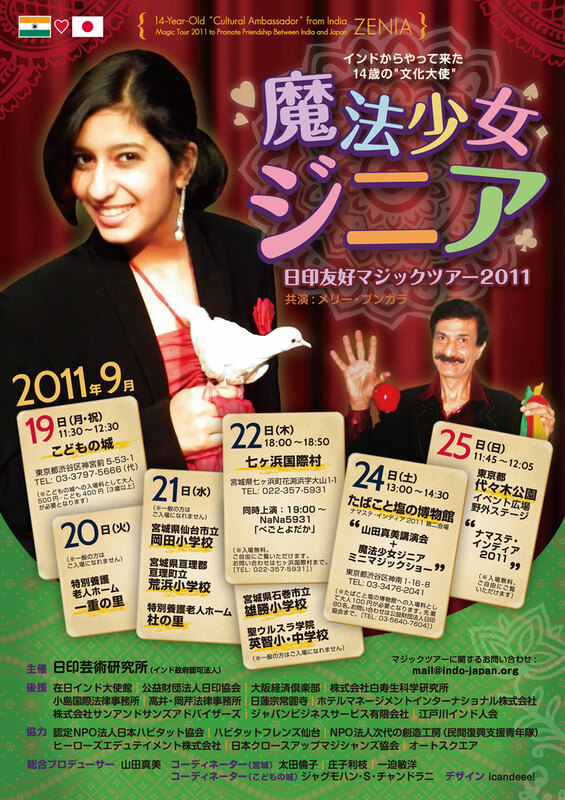 2011 Produces "ZENIA - Magic Tour 2011" to promote friendship between India and Japan. The venues include primary schools in Miyagi prefecture that were struck by the earthquake and subsequent tsunami on March 11. >>>To view the poster, click here (front) and here (back). 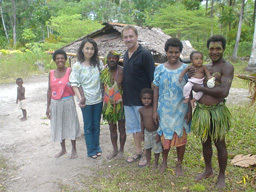 2011 Member, Japanese Society for Oceanic Studies. 2011 Admitted into the Doctoral program, Division of Interdisciplinary Gender Studies, Graduate School of Humanities and Sciences, Ochanomizu University to do full-scale reaseach on the Cowra Breakout, the largest POW breakout in the modern history. 2011 Contributes columns on Indian politics and ecomomy to "Britannica Year Book 2011 (Japanese version)". 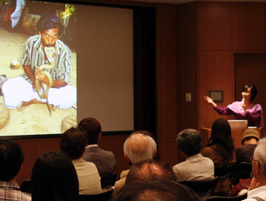 2010 Gives a lecture on Indian magic at "Namasthe India 2010", sponsored by Embassy of India in Japan, I.C.C.R., Ministry of Foreign Affairs, Tokyo Metropolitan Govt., The Japan-India Association. 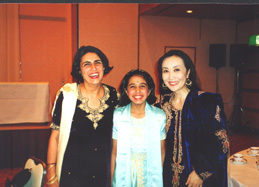 2010 Director, The Japan-India Association. To read Mami's informal inaugural message, click here. 2010 Contributes columns on Indian politics and ecomomy to "Britannica Year Book 2010 (Japanese version)". 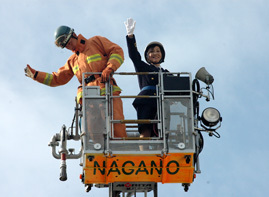 2009 One-day Honorary Chief of Nagano Municipal Fire Department. 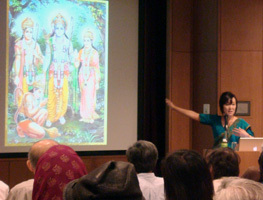 2009 Gives a lecture on Indian mythology at "Namaste India 2009", sponsored by Embassy of India in Japan, I.C.C.R., Ministry of Foreign Affairs, Tokyo Metropolitan Govt., The Japan-India Association. 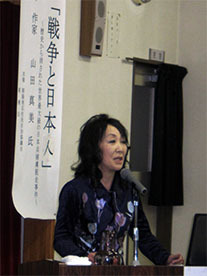 2009 Executive committee member for "Let's Enjoy Total Solar Eclipse Gathering" held in Tanegashima Island. 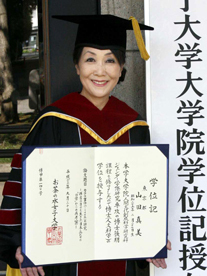 2009 Receives a master's degree in esoteric Buddhism from Koyasan University. The title of her master thesis is "History of Religious Oppression of Tibet - Dalai Lama's Religion and Politics". 2009 Contributes columns on Indian politics and ecomomy to "Britannica Year Book 2009 (Japanese version)". 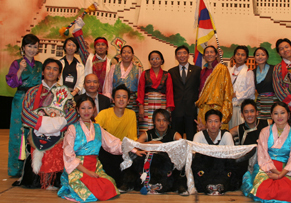 2008 Visits the Kingdom of Bhutan on the occasion of the Fifth King His Majesty Jigme Keshar Namgyal Wangdhuk's Coronation. first ever elected Prime Minister of Bhutan. 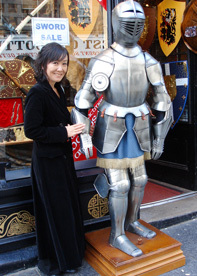 2008 Visits Scotland to collect materials for her future novel. 2008 Lecturer at Japan Inter Design Conference 2008 in Akasaka, Tokyo. 2008 Invited to International Magic Convention "Vismayam 2008", India's largest magic convention held in Kerala, as a cultural Ambassador. 2008 Contributes Buddhism-related essays to the news letter and website of Anyo-In and Kongo-In temples. 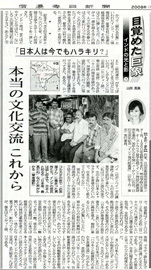 2008 Contributes a series of essays "Light and Shadow of the Awoken Colossus India" to the Shinano Mainichi Newspaper. 2008 Contributes columns on Indian politics and ecomomy to "Britannica Year Book 2008 (Japanese version)". 2007 Re-publishes "Wheel of Destiny" from Mudra Books, New Delhi. The book cover is designed by Mami's daughter LiA who majors fine arts at the University of Sydney. 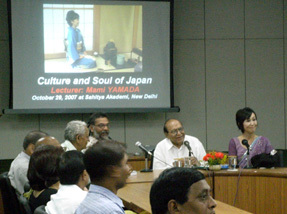 2007 Visits India for two months as Dr. Anand Coomaraswami Fellow of Sahitya Akademi (India's National Academy of Letters) to give lectures at various institutions on the themes such as 'Culture and Soul of Japan', 'Japanese Language and Literature', 'Study on Saraswati Devi and Benzai Ten'. 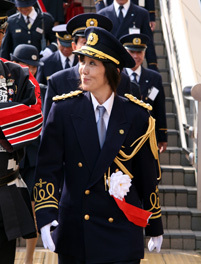 President of the academy, at her left. 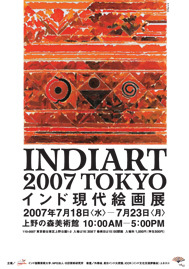 2007 Executive Committee Member, "India's Contemporary Art Exhibition 2007", under the auspices of Ministry of Foreign Affairs of Japan and Indian Embassy in Tokyo at The Ueno Royal Museum, Tokyo. 2007 Onward Member, Space Authors Club. 2007 Recipient of Dr. Anand Coomaraswamy Fellowship　from Sahitya Akademi (India's National Academy of Letters) in the year 2007-2008 for her achievements in promoting understanding between India and Japan through her literary activities. 2007 Contributes columns on Indian politics and ecomomy to "Britannica Year Book 2007 (Japanese version)". 2006 Publishes "The Monday Monster", a short adventure fantasy in English, in 'NHK Eigo de Shaberanaito' December issue. 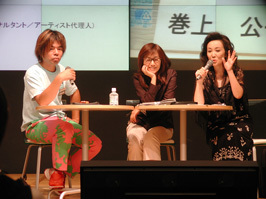 2006 Hosts a talk-show with the internationally-recognized architect Kisho Kurokawa and a leading Japanese artist Katsuhiko Hibino at Japan Inter Design Conference 2006 in Tokushima. 2006 Chinese translation version of "Shi to no Taiwa"(Spice, 2004) comes out from Prophet Press in Taiwan. 2006 Admits to master's course (esoteric Buddhism major), Faculty of Literature, Koyasan University. 2006 Interviews His Holiness the 14th the Dalai Lama on the theme "Things that each of us can do to prevent the World War III". Publishes "Plant the Seeds of English During the First Three Years of Life" from Spice Publishing Co. To read Mami's special essay "Planting the Seeds of Bilingualism", click here. 2006 Contributes columns on Indian politics and ecomomy to "Britannica Year Book 2006 (Japanese version)". 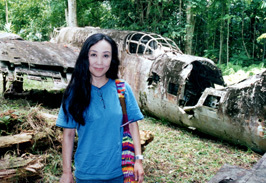 2005 Publishes "Lost Officer" (a nonfiction that reveals the unknown side of Cowra Breakout, the largest mass breakout in the modern history in which 231 Japanese POWs were killed and 108 injured) from Spice Publishing Co.
2005 Visits Far North Queensland, Australia, to collect materials for her future novel. 2005 Contributes columns to "Australia-Japan Connections", the official bilingual guide book for Australian Pavilion at the 2005 World Exposition, Aichi, Japan. 2005 Contributes columns on Indian politics and ecomomy to "Britannica Year Book 2005 (Japanese version)". 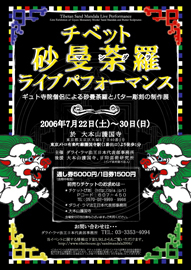 2004 Publishes "Shi to no Taiwa (Dialogue with Death)" from Spice Publishing Co. 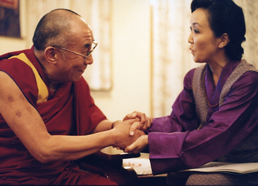 Her interview with His Holiness the Dalai Lama is contained at the end of the book. 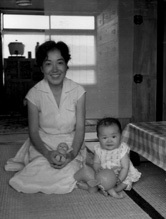 2004 Mami's Father, Hiroshi Suzuki, passes away at age 77. 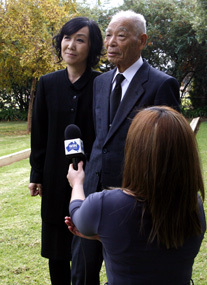 2004 Production staff of NHK's special program "The Great Escape in Cowra: Former Japanese POWs' Verbal Evidences 60 Years after the Incidence" (aired in August 2005). 2004 Interviews His Holiness the 14th the Dalai Lama on the theme "Japanese and suicide". His Holiness and Mami at Tibetan Govt. 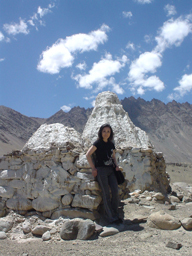 2004 Visits Ladakh, in the range of Indian Himalayas, to write an article on Hemis Fair for Monthly Waraku (Shogakukan Publishing Co.). 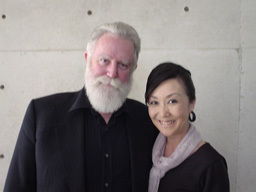 2004 Interviews internationally recognized artist James Turrell and contributes an art essay to Monthly Waraku (Shogakukan Publishing Co.). 2004-2011 Member, Japan Australia New Zealand Society, Inc.
2004 Onward Learns Shamisen, a traditional Japanese stringed instrument, from Prof. Mutsuko Fujiwara of Tokyo National University of Fine Arts and Music. 2004 Contributes columns on Indian politics and ecomomy to "Britannica Year Book 2004 (Japanese version)". 2003 Interviews Patricia Piccinini and contributes art essays to monthly magazines. 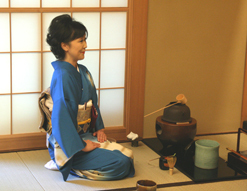 2003 Onward Learns tea ceremony from Prof. Sola Arai of Omote Senke Fuhaku-Ryu School. 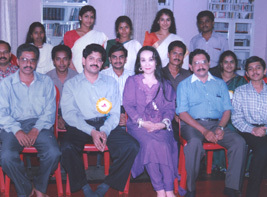 2003 Visits Kerala, South India, to write an article on Ayurvedic therapy, traditional alternative medicine, for Monthly Waraku (Shogakukan Publishing Co.). 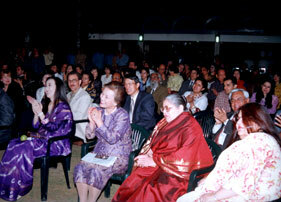 2003 Onward Director, Japan Bhutan Art Committee. 2003 Assistant Chairperson, Japan Inter Design Conference 2003 in Roppongi Hills, Tokyo. 2003 Publishes "Boosuke and Panda's Long Journey to Meet Lost Brother" from Gentosha Publishing Co.
2003 Onward Member, Public Relations Committee, National Astronomical Observatory. 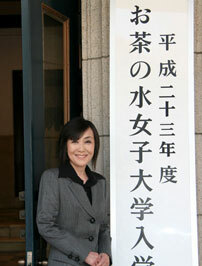 2003 Onward Member, Arachnological Society of Japan. 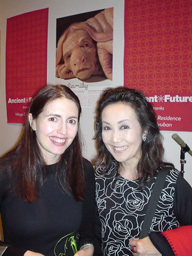 2003 Visits Greece to collect materials for her future novel. 2003 Publishes "Boosuke and Panda's Mission Impossible in English" from Gentosha Publishing Co. The book became No. 1 Seller at Amazon.co.jp in February-March 2003. 2003 Contributes columns on Indian politics and ecomomy to "Britannica Year Book 2003 (Japanese version)". 2002 Visits Sydney to collect materials for her future mystery novel. 2002 Invited to Papua New Guinea, again, by Air Niugini. 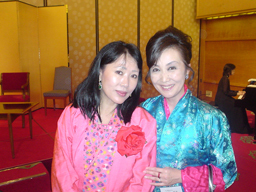 from left) with her TV producer friend Mr.
2002 Publishes "Black Umbrella" (a novel about polyandry marriage system in South India) from Gentosha Publishing Co.
2002 Publishes "Yoake No Ban Ni" (Vol. 1 andVol. 2)", a novel about the ancient link between Jewish and Japanese, from Gentosha Publishing Co.
*In 2007 this book was selected and incorporated in 'the Balanced Corpus of Contemporary Written Japanese Project' led by The National Institute for Japanese Language. 2002 Contributes columns on Indian politics and ecomomy to "Britannica Year Book 2002 (Japanese version)". 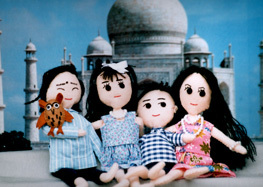 2001 Visits India as a coodinator/commentator for Nippon TV's special program "Cho Tokudai Nama Hoso Plus 1 Special". 2001 Invited to Papua New Guinea by Air Niugini. 2001 Organizes a series of Buddha Painting Seminars in Nagano and Saitama. 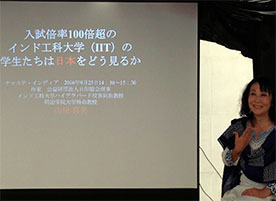 2001 Appointed to the Director Linguistics, Indo Japan Art Institute Trust (Register No. 2300 New Delhi). 2001 Contributes columns on Indian politics and ecomomy to "Britannica Year Book 2001 (Japanese version)". 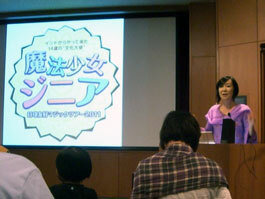 2000 Organizes magic shows by Pearl The Magician Girl for Japanese children as a cultural program. 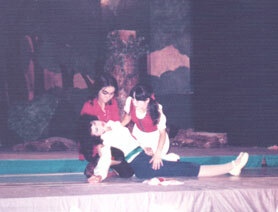 Pearl The Magician Girl is the winner of SAM (Society of American Magicians) Junior Competition 2000. 2000 Publishes "Wheel of Destiny" (a non-fiction about Indian magic and magicians) from Golden Eagle Press. 2000 Opens this website on September 9th. 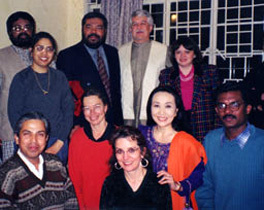 1999-2001 Learns Hebrew from Ms. Shlomit Hayat, a Hebrew University professor who is officially visiting New Delhi from Israel. 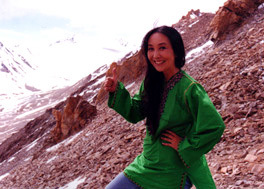 2000 Travells Kashimir, Ladakh and other Himalayan districts to collect materials for her future novel "Yoake No Ban Ni". 2000 Contributes columns on Indian politics and ecomomy to "Britannica Year Book 2000 (Japanese version)". 1999 Contributes columns on Indian politics and ecomomy to "Britannica Year Book 1999 (Japanese version)". 1998 Publishes "Mango No Ki", a non-fiction about a traditional Indian magician who can grow a magical mango tree from no where, from Gentosha Publishing Co.
1998 Guest judge for Vismayam 1998, India's largest magic convention held in Kerala. 1998 Learns Malayalam, the language spoken only in Kerala, from an internationally renowned author/atheist Mr. Joseph Edamaruku. 1998 Contributes columns on Indian politics and ecomomy to "Britannica Year Book 1998 (Japanese version)". 1997 Contributes columns to the Ministry of Foreign Affair's monthly magazine. 1997 Publishes "Indo Dai Maho Dan", a non-fiction about a traditional Indian magician who could stay under water for hours, from Seiryu Publishing Co.
Mami and the famed magician Mr. P.C. 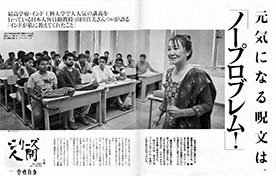 1997 Contributes columns on Indian politics and ecomomy to "Britannica Year Book 1997 (Japanese version)". 1996-98 Contributes essays on everyday-life in India to Monthly Seiryu. 1996-2001 Contributes essays on everyday-life in India to the Shinano Mainichi Newspaper. 1996-2001 Invited by I.C.C.R. 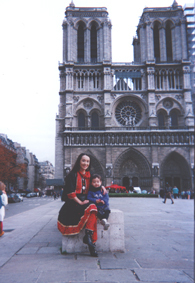 (Indian Council for Cultural Relations) as a research scholar at graduate school of Delhi University, major in philosophy, and resides in New Delhi with her family. were delicately hand-made by Mami. 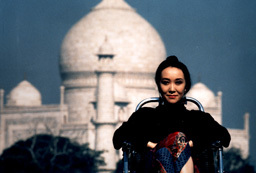 1996 Receives the second prize at Sogo Hodo Thesis Competition with her thesis "Future Vision of Outdoor Advertisement: How to Cooperate with the Scenic Beauty". 1996 Contributes columns on Indian politics and ecomomy to "Britannica Year Book 1966 (Japanese version)". 1995 Translates Mr. Harry Gordon's "Voyage From Shame", a non-fiction about Cowra Breakout, into Japanese and publishes as "Ikite Ryoshu No Hazukashime Wo Ukezu" from Seiryu Publishing Co.
1995 Talk show with Mr. Takekuni Ikeda, a renowned Japanese architect who designed Japan's first skyscrapers. 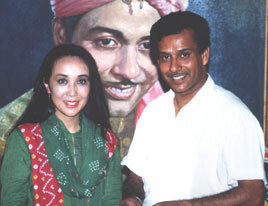 1994 Invited to India by the Ministry of Tourism, Government of India. 1993-95 Contributes columns on Indian myth and legend to Monthly Kigisu (a Haiku magazine). 1993 Writes essays on Japanese culture for a French CD-ROM. 1993 Publishes "Kissho-ten To Iku Indo No Tabi (Journey to India with Goddess Lakshmi)" from Government of India Tourist Office in Tokyo. 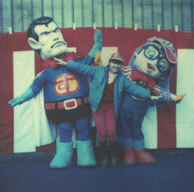 1993 Hosts a TV program "Kagami Art Museum" (SBC). 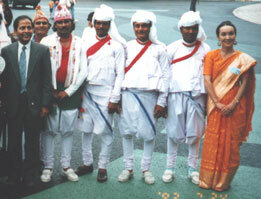 1993 Produces India Week at Japan Exposition in Shinshu. 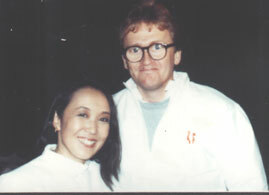 1992-93 Hosts a series of TV programs "Discover Hi Teck!" for 60 weeks (SBC). 1992 Stays in Bali, Indonesea, for a research on Bali Hinduism. 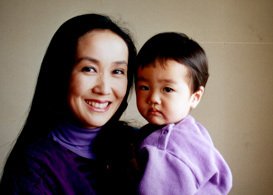 1991 Publishes "Nanzenji Diary (a collection of 41 essays) from Inter Reps Co.
1991 Mami's second child, a boy, is born. He is named Nasa as he was conceived in Houston, U.S.A.
1991 Official press coordinator for the Houston International Festival 1991. 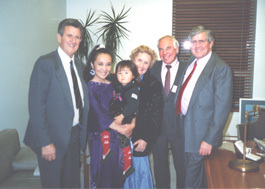 1990 Invited by I.C.C.R. (Indian Council for Cultural Relations) as a research scholar and travells all over India for 3 months. 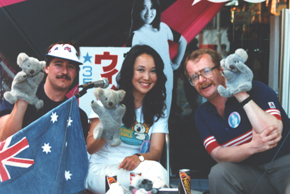 1988 Invited to Australia by Australian Bicentennial Committee to give lectures on Japanese culture at women's clubs and high schools in Sydney and Brisbane. 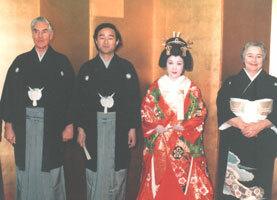 1987 Contributes columns on Noh theater, a traditional Japanese play a.k.a. Nogaku, to the Mainichi Daily News. 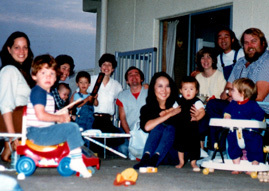 1987 Youngest lecturer at Japan Inter Design Conference 1987 in Nagano. 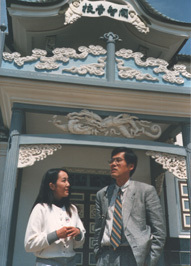 1986-87 Hosts a series of TV programs "Architecture Detective" along with Prof. Fujimori of the University of Tokyo (SBC). 1986-89 Contributes essays on everyday-life in a beautiful snowy village in Japan Alps where Mami has her studio, to the Shinano Mainichi Newspaper. have the same surname; "Yamada". 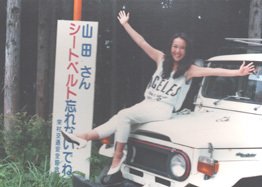 1986 Chosen by a Japanese department store as the "image woman" for their summer campaign. Appears in a TV commercial film and gives several lectures such as "How to Study Abroad" for young girls. 1985 Mami's first child, a girl, is born. She is named Lia which is the last three letters of AustraLIA as Mami and her husband met in Australia. 1985 Invited to U.S.A. by Memphis in May International Festival, Inc. Travells 25 states of U.S.A. and contributes a series of essays to the Shinano Mainichi Newspaper. 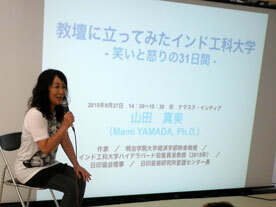 1983 Marries to Masami Yamada, a renowned artist (Japanese style painter). 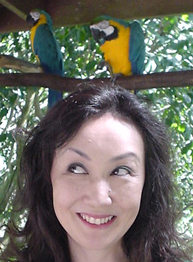 >>>Please click here to enjoy Masami's website. 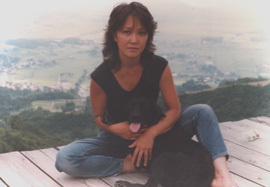 Mami and her pet dog "Bear"
1982 Graduates from Meiji Gakuin University (Bachelor of Economics) and continues her studies at the University of New South Wales, Sydney. 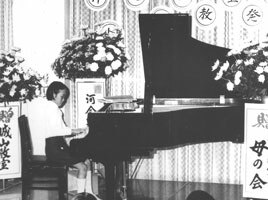 1978 Enteres Meiji Gakuin University, the oldest Christian university in Japan. Besides majoring economics, Mami experiences various part time jobs e.g. English interpreter, English speaking bus conductor, English translator, magazine editor, MC, secretary for the Himalayan expedition team and so on. The title of her graduation thesis is "History of World's Whaling from an Economic Point of View". 1975 Enteres Nagano Nishi High School, the oldest girl's school in Nagano prefecture, where Mami fully enjoys her active, creative life as the chairperson of student council and the director of E.S.S. 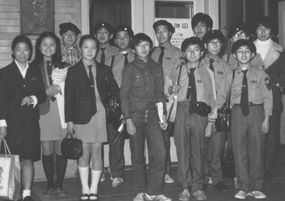 1972 Enters Yanagimachi Middle School in the city of Nagano. As an English lover, Mami's dream is to be a genuine bilingual in Japanese and English someday. 1966 Enters Joto Primary School in the city of Nagano. At the age of nine, she writes her first five stories and declares that she would become a professional writer in future. 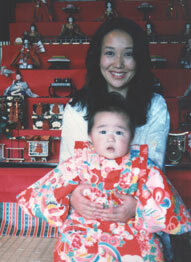 1964 Mami's one and only sibling (brother), Hisashi, is born. 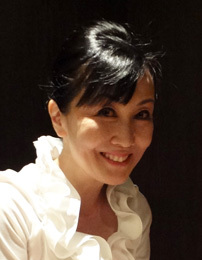 1960 Born in the city of Nagano, about 200km north west of Tokyo, as the first child of Hiroshi Suzuki, a government officer and a master of Go (Asian chess game) and Takae Suzuki, a former secretary of a major publishing company and now a housewife, on February 27th.